Worm Tea – OurWorm Tea is one of our most popular products, an infusion produced by steeping water in our purest worm castings for a period of 3 days by means of an aeration process that preserves and enhances the power of the liquid’s beneficial microorganisms. 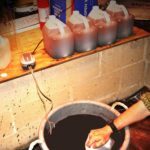 We then bottle the liquid, which looks very much tea. But don’t drink it: it’s for plants, not people! Though nitrogen-rich, worm tea can be fed directly onto plants without fear of burning. This is because, like OurCompost™, OurWorm Tea is low in inorganic Nitrogen (NH₄ and NO₃), but high in organic Nitrogen (N₂). OurWorm Tea is also rich in phosphate, calcium, magnesium and potash. Like OurCompost™, it works by promoting the growth of mycorrhizae, a symbiotic association between fungi and the roots of vascular plants, resulting in enormously improved root growth. OurWorm Tea is not only a great organic plant food, it is also a natural repellent for aphids, spider mites, scale and white flies. It will not kill insects, but repels them because it strengthens the plant’s natural immune systems, at the same time promoting habitats for beneficial insects such as ladybugs. 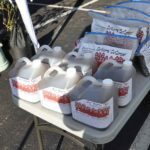 Worm tea increases plant abundance and flavor in fruits and vegetables by many manifold degrees and can be used year round, indoors or outdoors, though it is not a good idea to feed plants in their periods of dormancy. Worm tea must be used within 24 hours after the aeration process has stopped, since the microbal process described above thrives only in an aerobic environment. That’s why we bottle OurWorm Tea the last thing before we head out to Market (4:30 AM!) and why it prominently is labelled with a 24-hr. expiration tag. 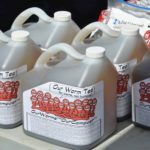 OurWorm Tea is available in gallon sizes, though special orders of larger amounts can be arranged. A returnable bottle deposit of $1 is charged with each gallon.